Maybe you need some hand holding when it comes to sharing the gospel? Yeah, me too. Even though I’ve been a missionary for many years, sharing the gospel with a stranger can feel scary, intimidating, and awkward. Maybe your wondering how how to share the gospel? Or maybe your looking for fresh, creative ways to share the gospel. Maybe you just want someone to walk beside you while stepping out into the uncomfortable. You want to know you’re not alone. When we talk about how to share the gospel, it’s important to understand what the gospel is. It is not your personal testimony. It isn’t sharing a random scripture. It isn’t an apologetic debate. Neither is it a heated argument over theology. The gospel is simply the good news about the life, death, burial, and resurrection of Christ… important tidbit to keep in mind as we learn how to evangelize and look at the following ways to share our faith. Before you get started, I invite you to check out my 6 personal tips for sharing the gospel. 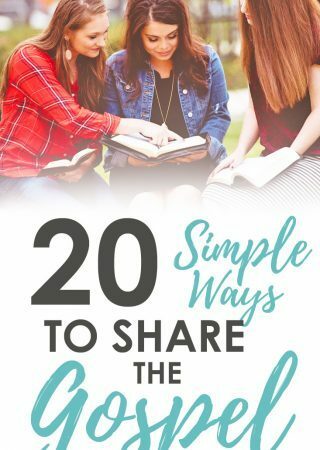 Finding your own favorite simple way to share the gospel can give you confidence when it’s time to present the gospel with someone, so try several different ideas! And just for fun, what is the best way to share the gospel? I like this answer here; and this admonition to talk to strangers. Sharing the gospel can be fun! Our stories are not the gospel; the gospel is the good news about Jesus Christ. Our stories can incorporate this good news though! Every believer should be ready in season and out of season to share what God has done in her life. If you’re like me, something as simple as a personal testimony can seem overwhelming. Never fear because this is actually super simple if you know the three simple elements Paul included when sharing his testimony in Acts 26:1-23. First, take three minutes to read Paul’s testimony for an example of what you’re aiming for. Now you’re ready to prepare your own short story. That’s it! If you haven’t taken the time to jot down your personal testimony, why not do it now? This is probably the easiest way ever to share your faith and everyone likes to hear a personal story. It’s okay to practice this a few times so it is natural and you are comfortable with it first. Try to keep it short (2-3 minutes) and authentic. Each time you share, speak it from the heart! For a worksheet to help walk you through these steps, check out Laura’s free personal testimony worksheet here. Sometimes before you can share your testimony or a gospel presentation, you simply need to get to a spiritual conversation. You can do that by asking a few good questions. This is the approach I personally take with strangers I encounter during the course of every day living. I do this with taxi drivers, store clerks, and others I happen to strike up conversation with. I do need to say that we are people talking with other people. The goal isn’t just to vomit gospel facts all over someone. It is to show the love of Christ and be the aroma of Christ. This means that you’ll need to listen. Like a lot. Sometimes I listen a whole lot and end up sharing a verse or only saying something like, “God loves you” to the other person before our time is up. While my goal is to share the entire message, it sometimes doesn’t work out. That’s okay because I want to be authentic and genuinely compassionate. I trust the Lord to take the little I do and multiply it. Here are some ideas to get you brainstorming on conversation starters. I suggest you take a few minutes to come up with your own set of questions that come naturally for you. > Are you a religious person? > Do you know how to have a relationship with God? > Did you grow up in church? What were you taught about God growing up? Do you still believe that? > May I pray for you? Do you have any special needs I can pray for? > What do you think the solution to (insert recent troubling news event) is? > Do you have time for a short story? It’s the greatest thing that’s ever happened to me and I love to tell people about it! For a good article on asking deep questions that lead to sharing the gospel, read this post from Desiring God Ministries. This method of sharing the gospel uses pictures and is super easy to use. When we first arrived on the mission field, we kept one of the cubes in our home and used it to share the gospel. This simple gospel presentation came in handy when we had limited language ability- the pictures were so helpful! The makers of the cube have produced many different resources you can carry on your person, such as a bracelet, a card, a key chain, a cube, a ball, and more. Click the link to check them all out. Courtney shows a super fun way to share the gospel using sidewalk chalk. This is a creative way to share the gospel with you and you can do this at the beach in the sand or at the cafe on the back of a napkin. Kids can learn this too! There are many, many great gospel tracts available for every occasion imaginable. You’ll want to find one or two you personally feel comfortable giving out and talking about. I like shorter tracts simply because they are more likely to be read. Here is a list of bestselling tracts written by people like Billy Graham, John MacArthur, John Piper, Josh McDowell, and others. You can get a pack of 25 for just $2.50. Start with one of the variety packs to find a few you really love. Can’t speak a foreign language? With these resources, you don’t have to! This site has tracts, audio, and other resources in many different languages. If someone in your community is from another country, be sure to check out this site for free resources. *Note: I have not read all the material on this site. I recommend reading through their English materials before using. These days you can use your phone to share the gospel. I’m grateful for those who have designed Bible apps specifically for sharing God’s Word, aren’t you? To find an app (or two or more!) for your device, simply go here and select the device you are using. Wow! This is a gospel sharing campaign designed for teenagers (but suitable for everyone!) The folks at Dare 2 Share have put together some great resources and a simple plan for using them. I highly recommend checking them out to know what’s available. Maybe you have someone on your heart but emotional distance keeps you from having a good conversation with them. Writing a letter and including your personal testimony and the facts of the gospel is a great way to share the good news. Use one sheet of paper to tell the gospel story. This is so fun and will keep young and old alike riveted! You’ll want to practice before hand so you have it down; then just keep a piece of paper with you at all times and you’ll be ready to go! This simple method covers the basic message of Christ using Romans 3:23. It is an easy way to share the gospel conversationally and visually. This article walks you through how to use it. Each of these films are adaptations of scripture. Some have been around for awhile but are still great ways to present the gospel. Host a movie night and invite neighbors over or have each family in your small group invite a lost friend or family member to the movie night. Be prepared to follow up with spiritual questions. Speaking of movie nights, we know a missionary family in our city who regularly hosts movie nights for the purpose of sharing the gospel afterwards. Some of the movies they have watched are Courageous, Soul Surfer, Luther, and Fireproof. There are many new Christian movies that would work well for a movie night and for talking about God and our faith in Christ. Be intentional about presenting the gospel after the movie. Besides my personal testimony, this is the method I use most. I don’t include every aspect of the story every time because the entire presentation takes about 15 minutes. But this method is very effective when sharing with those who do not have a church background. You can download an app from this site as well as a PDF, and view the entire presentation. You’ve probably seen this one~ it is a simple bracelet with colors representing the facts of the gospel. Just wear it and use it! Christian book.com carries the bracelet and scripture reference card. This is a great resource if you’re looking for how to share the gospel in five minutes or less. I hope this helps equip you with practical resources for becoming someone who shares her faith. In fact, let’s each commit to choosing one of these methods of personal evangelism this week. Let me know what you’re committing to in the comments! Let me know how I can pray for you and be sure to share your favorite resources as well…I’m praying for you! Wow! These are wonderful ways to share the gospel; thank you for all your time and effort to get these resources in our hands. I will share these for sure. It’s amazing to me when we step out and share with others, that God gives us everything we need to present to the person or persons. I like one on one sharing but have shared with an audience before. I will explore the list and step out of my comfort zone and try a new way. Much appreciation for this. It is pretty amazing, isn’t it Tammy? What a great resource this is, AJ. I’m so glad you posted it. Definitely going to consider several of these! Great list of resources. I think one of the best things we can do is live out our lives to reflect Christ and then share the reason we find such joy and hope in Him. Why is faith important to our lives? We did a workshop on sharing our stories and had this simple template – briefly, what was your life before God; BUT GOD intervened and ___; then how has your life been changed by God. That’s great! I love the “But God ______” idea!! Hey friend! I LOVE this and I love your heart for the gospel! Thanks for the kind word friend! Thanks – there are some great resources here. I’ll have to bookmark this page! What a great resource this is! Thanks for taking the time to put it together. I’ll be sharing the daylights out of this one! I hope it is useful for you. Thanks for sharing! Wonderful post, friend. I so appreciate this compilation of resources! Thank you for pointing our attention back to one of our main purposes as Christ-followers: telling others the Good News. 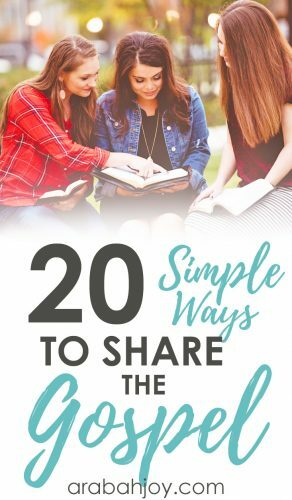 Good ideas and methods for sharing the gospel. It is something that I struggle with, particularly with those that I know whose hearts are hardened. I will try some of the methods you discussed. awesome compliation and a great starter list. That’s a super idea Henry! Thanks for sharing! When my kids have done missions trips overseas, they used the Evangecubes and the wordless book bracelets, so I’m familiar with those. Sometimes just delivering a pie or homemade dessert to a neighbor can open the door as well. Mostly, my tactic is asking them about their lives first and then if they believe in God or the Bible. That usually opens up a whole can of worms! This whole post is so full of many great ideas, I’m excited to share today! Hello! Thank you for your commitment to sharing the gospel and the ideas. As a fairly new Christian, I am looking for ways to share what Christ has done in my life and have so much compassion for the lost! Praying for ways to be used! I took a class called evangelism explosion or EV2 and I highly recommend it. It teaches anyone how to share the gospel in 5 easy steps. I would love to share it if you are interested. Please look it up if you have never heard of it. It really is an excellent tool to use! Thank you for including The HOPE film as one of the resources you recommend! The HOPE is now in 68 languages and is being used all around the world to introduce people to The Bible and to Jesus Christ. In addition to being an overview of the biblical story of salvation, there is also an in-depth companion study guide so that it makes a great Bible study tool. So that all may hear! THanks for sharing that tip Brenda! many languages. Ebooks, online free, movies Business cards to hand out with all that content. 1000 scriptures in many resources. Blessing s on all you do to reach those about you. browsing for thoughts on this issue last Wednesday. So many great ideas! I love how you talk about being authentic when you are talking to people. I have found that by just loving people and being genuinely invested in what they say has opened many doors for me to witness. I appreciate the questions you added to help facilitate meaningful conversations about faith and more importantly eternity with others.